A Multiinstrumentalist, composer, arranger, vocalist. Founder member and the band lider of SHANNON (since 1994) and HOBOUD (since 2008 - Polish Folk Music Album of the year 2009). He's a specialist in playing at folk instruments like: irish whistles, great highland bagpipes, uillean pipes, bombard, duduk, mandolin, Doshpuluur. 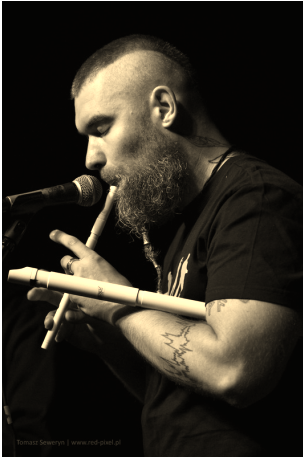 As a singer, Marcin uses the singing technic from Tuva (near Mongolia) which is called "throut singing" (khoomei, kargyraa). As a composer and arranger he often uses ethno, roots influences to mix modern sound with traditional music from whole over the world. Dispite of the SHANNON he's recently working as a music producer, recording engineer, and writing some music to drama Theatres and movies. 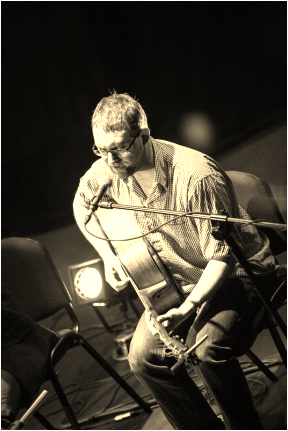 vocalist, instrumentalist (keyboards, melodeon), composer and arranger. Graduate of the Faculty of Jazz and Light Music in The Karol Szymanowski Academy of Music in Katowice. Maria is an active performing musician for nearly a decade now. Her vocal contributions include cooperations with ethnic music bands as well as jazz and jazz-influenced bands: Helmucik Quartet (O.Walicki), Kaszebe (O.Walicki, K. Amirian, P.Pawlak). She is a co-founder of the band Hoboud ('Wskrzeszenie Hobouda' 2009 - winner of the Third Prize at Polish Radio Folk Festival 'Nowa Tradycja' 2009, 'II Folkowy Fonogram Roku 2009' and 'debiut ethno 2009' in Metal Hammer magazine) and a permanent musician of Shannon (since 2006). Apart from being a regular musician in bands, she also cooperates with prominent Polish theatrical directors, co-creating dramatic performances (such as 'Nieskończona Historia' - dir. Ula Kijak), puppet theatre performances ('Pieśń o Cieniu' - dir. U.Kijak), music shows ('Tango Nuevo - dir. G.Castellanos) and radio drama ('Bóg Zapłacz' - dir. Jamusz Kijowski). Maria has composed and produced soundtracks to over a dozen performances in theatres all over Poland. Since 2008 she is the Music Director of The S. Jaracz Theatre in Olsztyn. 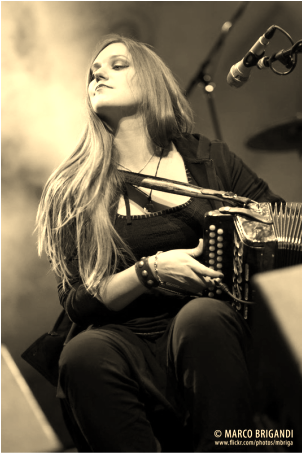 A multi-instrumentalist connected for nearly two decades with the leading groups of the Polish Ethno scene: Balkan Sevdah, Danar, Karpatia, Maayan, Same Suki and Shannon. She graduated from Adam Mickiewicz University at the geo-information department. Despite the fact that her studies lost with her music passion they quite influenced the choice of the music genres that Patrycja does today. These are: ethno, world, folk, folklore. In her work the wide range of percussion instruments can be heard, i.e. 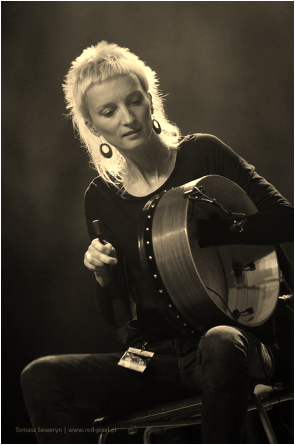 The Bodhran – characteristic for the Irish culture and connected with The Middle East culture (Bendir, Duff, Doumbek etc. ), The Cajon and The Niger Udu. The wide range of music fascinations and the collaborations with the bands of ethno genre makes Patrycja a session musician permanently working with the prestigious Vienna recording studio called EuroAccoustics. From the end of 2011 she is the official endorser of the bodhrans made by Robert Forkner as the only woman out of two bodhrán players of non-Irish origin, who have their own bodhrán signatures. She eagerly shares her passion with others by leading private and group drum courses for children, teenagers and adults. Plays the violin and nickelharpia. Katowice Jazz Institute graduate, prize winner of numerous music competitions, such as "Złote Gęśle" - special award on Polish Radio folk competition, "Baszta" - main prize at Festival of Folk Bands and Singers in Kazimierz, and second prize at the "Solo Życia" competition ("The Solo of Life") for best rock solo (electric violin). Regular musician in bands: Shannon, Poszukiwacze Zaginionego Rulonu. He took part in many ethno-world music projects, recently soundtrack for "Gra o Tron" audiobook ("Game of Thrones"). His main music inspirations are violin traditions of Poland, Bulgaria, Ireland and Sweden. 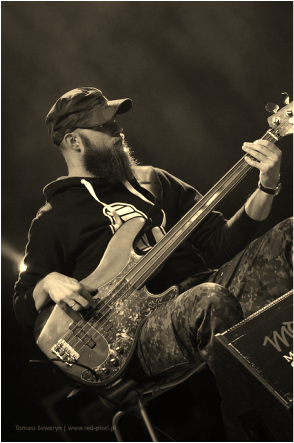 Jacek graduated from the Karol Szymanowski State Music School in Częstochowa in the bass guitar class of Prof. Michał Konopelski. He had his first experiences with music in the 'Radioaktywni' studio, recording with numerous bands from Częstochowa, such as Ideo, Żywe Srebro, CDS. Together with the band Lari Fari, he published a CD 'Dusza' and performed at The National Festival of Polish Song in Opole in 2002. At the same time he cooperated with the band Tam Tam Hare as a composer and arranger. In 2004, together with the Jazz band JWP. ORG. (founded with D. Wania and W. Fedkowicz), he was awarded First Prize at the Jazz Juniors Festival in Cracow. Jacek currently cooperates with i.a. Wojtek Fedkowicz Noise Trio, O.S.T.R., Shannon. begain playing traditional Irish music at the age of six. Beginning on the Irish Tin Whistle before moving on to guitar a few years later. Since then he has gained over thirteen years experience as a professional musician. In that time he has worked with acts such as The Young Wolf tones, The Discovery Gospel Choir, The Voyagers and toured in Europe, Poland and the U.S. 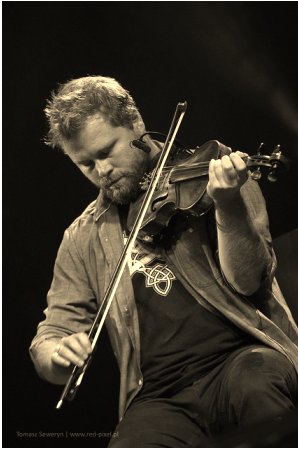 He has also played festivals such as Picnic, Flat Lake festival, The Flea Ceoil, and the Temple Bar Trad Fest. In addition to this Oisin has provided corporate entertainment for companies such as The Guinness Store House, The Old Jameson Distillery, and Google’s European headquarters. As well as playing with Irish dance shows Celtic Rhythm and Damhsa. Oisin has also worked as composer and musical director for Little Maggots Theatre company. He holds a Higher National Diploma in traditional Irish music as well as a Batchelor Of Arts Degree in media production management.